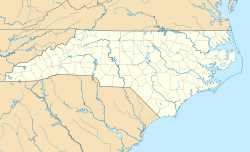 Laurinburg is a mid-sized city in Scotland County, North Carolina, United States. It is the county seat of Scotland County. Located in southern North Carolina near the South Carolina state border, Laurinburg is southwest of Fayetteville and is home to St. Andrews Presbyterian College. The Laurinburg Institute, a historically African-American school, is also located in Laurinburg. Laurinburg is located at 34°45′53″N 79°28′13″W﻿ / ﻿34.76472, -79.47028 (34.764663, -79.470146). According to the United States Census Bureau, the city has a total area of 12.6 square miles (32.5 km²).12.4 square miles (32.1 km²) of it is land and 0.2 square miles (0.4 km²) of it (1.27%) is water. As of the census of 2000, there were 15,874 people, 6,136 households, and 4,221 families residing in the city. The population density was 1,280.2 people per square mile (494.3/km²). There were 6,603 housing units at an average density of 532.5 per square mile (205.6/km²). The racial makeup of the city was 50.54% White, 43.06% African American, 4.23% Native American, 0.76% Asian, 0.03% Pacific Islander, 0.35% from other races, and 1.04% from two or more races. Hispanic or Latino of any race were 1.06% of the population. There were 6,136 households out of which 32.1% had children under the age of 18 living with them, 41.8% were married couples living together, 23.2% had a female householder with no husband present, and 31.2% were non-families. 27.9% of all households were made up of individuals and 11.0% had someone living alone who was 65 years of age or older. The average household size was 2.46 and the average family size was 3.00. In the city the population was spread out with 26.6% under the age of 18, 10.7% from 18 to 24, 25.9% from 25 to 44, 22.7% from 45 to 64, and 14.1% who were 65 years of age or older. The median age was 36 years. For every 100 females there were 81.2 males. For every 100 females age 18 and over, there were 74.7 males. The median income for a household in the city was $29,064, and the median income for a family was $37,485. Males had a median income of $31,973 versus $25,243 for females. The per capita income for the city was $16,165. About 19.7% of families and 23.6% of the population were below the poverty line, including 35.5% of those under age 18 and 18.6% of those age 65 or over. Laurinburg is served by the local newspaper, The Laurinburg Exchange. Robert Dozier, college basketball player for the Memphis Tigers, went to high school in Laurinburg. Kelvin Sampson, Born in Laurinburg, NBA assistant coach for the Milwaukee Bucks, former Indiana Hoosiers and Oklahoma Sooners men's basketball coach. Joseph Roswell Hawley Four-term US Senator, two-term US Congressman, Governor of Connecticut Union Brevet Major General during the American Civil War. Born near Laurinburg October 31, 1826. This page uses content from the English language Wikipedia. The original content was at Laurinburg, North Carolina. The list of authors can be seen in the page history. As with this Familypedia wiki, the content of Wikipedia is available under the Creative Commons License.